Greenland Ground Zero for Global Soot Warming | Watts Up With That? I was at the Doctor’s office and picked up the following magazine in the waiting room. 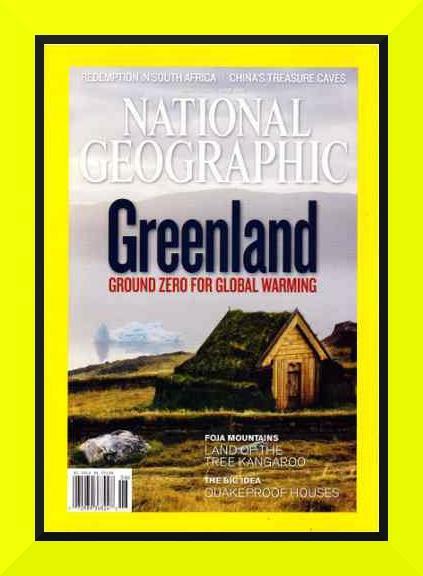 National Geographic June 2010 issue entitled Greenland Ground Zero for Global Warming. Melt Zone There’s a meltdown on the ice sheet—and optimism among Greenlanders. Viking Weather The warming climate that enticed Erik the Red is returning. Now how can you claim that on the one hand we created the current warming trend and on the other hand admit that there was a time when the climate was much warmer than today. In fact, use that history as a means of suggesting how things might look as we humans warm the planet to temperatures never seen except during the time of Erik the terrible. What a riot! Of course images like this one at left showing water tumbling down a huge moulin are being held up with gloom and doom scenarios that say Greenland’s Ice is melting “faster than expected” and we’ll get six feet of sea level rise from it along with a 10-15°F temperature rise by the year 2100. Perhaps. But, moulins have existed since Greenland had ice, they are just part of the natural landscape and processes. They aren’t “new” to our time. One of the photos we don’t often get to see was also circulated in the email, by somebody who lives in Greenland and knows what this is really all about. In the winter a huge among of snow are accumulated on the Ice (2-3 meters, sometimes more) and we are not talking about 1 or 2 square-miles, it’s about 100.000’s of square miles (up to 1 million) on the Westside of the Ice cap and a similar picture on the Eastside… when the melting season starts in april-sep… the meltwater has to go somewhere, and for sure it goes downhill in huge meltwater rivers. Here in Kangerlussuaq, on the edge of the Ice Cap, we have several burst from edge-lake, all the water (millions of tonnes) in the river passing through the settlement in a day or two. The Vikings (Eric the Red) is about Medieval warm period…. the Hockey-stick mystery!!! 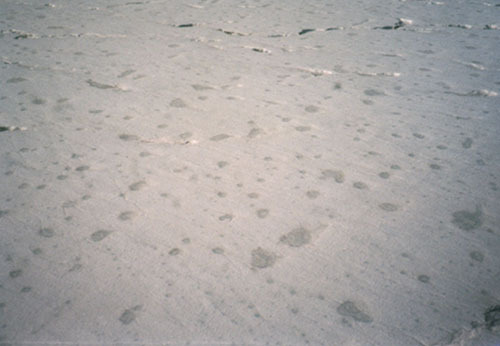 Cryoconite holes are water filled holes caused by increased melting around sediment. Cryoconite holes are common on the surfaces of glaciers in polar and non-polar regions (in polar regions, cryoconite holes have an ice lid, while in non-polar regions, cryoconite holes are open to the atmosphere). Cryoconite holes are not limited to glaciers. Cryoconite holes are also found on lake ice and sea ice. I will investigate whether sediment is required to initiate melt in the subsurface of a glacier, or whether absorption of solar radiation by clean ice is only needed to allow melting to occur. Previous studies have shown that some cryoconite holes are interconnected by cracks within the ice, while the remainder are isolated. 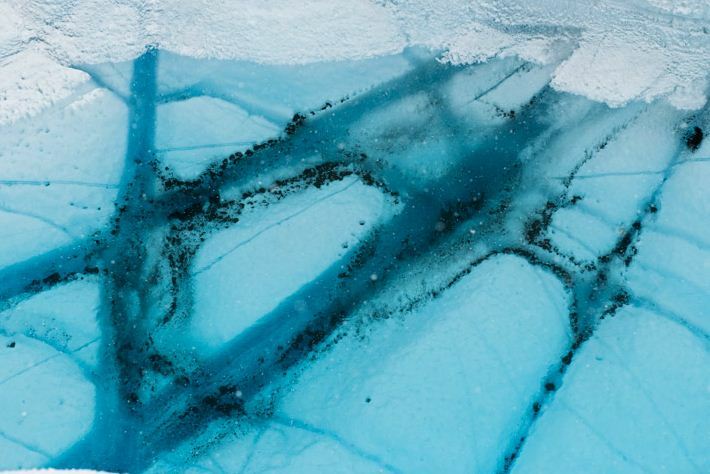 These cracks appear to be the means by which the subsurface melt exits the glaciers, discharges into the melt-water streams, and empties into the perennially ice-covered lakes. Click on the image below to view the evolution of two cryoconite holes over a 41 hour period. Watch how quickly the sediment melts down into the ice, and how fast the hole ices over. The movie will show the ice lid thickening and the hole filling up with air, half way through the movie (visible as the hole becoming lighter in color). Now the really interesting thing about all this cryoconite or black dust and soot is that it tends to accumulate and stay there, continuing to help with melting daily. 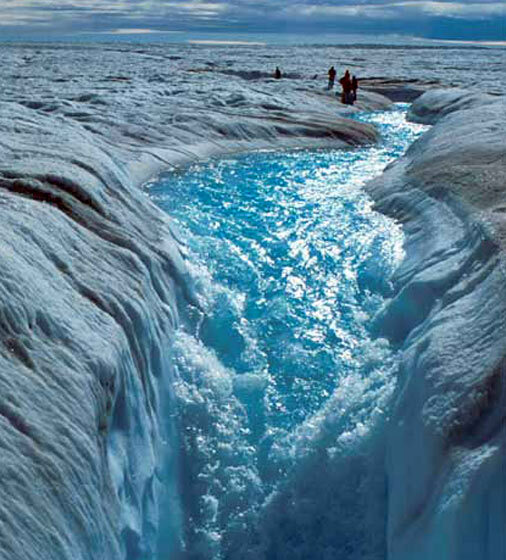 If the holes are interconnected with cracks through which meltwater flows, then they’ll continue until such time that the hole gets so deep that no sunlight reaches the bottom. I’m remined of a simple experiment that Mike Smith carried out in his backyard one winter. At the same time, the ash-covered areas have a depth of about 2.5 inches. Multiple measurements were taken (note ruler hold about an inch in front of ruler) which yielded an average depth of 2.5 inches. The areas without soot melt about 0.5 inches of snow during this 4-hour period while the soot-covered areas melt 3.5 inches. For visual comparison purposes, note the ruler hole in the non-ash-covered snow above the shadow. Even tiny amounts of soot pollution can induce high amounts of melting. There is little or no ash at upper right.. Small amounts of ash in the lower and left areas of the photo cause significant melting at the two-hour mark in the demonstration. Any discussion pertaining to melting glaciers or icecaps must consider the accelerated melting caused by soot pollution in addition to any contribution from changing ambient temperatures. Mike Smith is CEO of WeatherData Services, Inc., An AccuWeather Company. Smith is a Fellow of the American Meteorological Society and a Certified Consulting Meteorologist. Note that this is just a snapshot of the atmosphere, it doesn’t show where the soot ends up, but as you can see, it does reach the latitude of Greenland. Black carbon (BC) from biomass and fossil fuel combustion alters chemical and physical properties of the atmosphere and snow albedo, yet little is known about its emission or deposition histories. Measurements of BC, vanillic acid, and non–sea-salt sulfur in ice cores indicate that sources and concentrations of BC in Greenland precipitation varied greatly since 1788 as a result of boreal forest fires and industrial activities. Beginning about 1850, industrial emissions resulted in a sevenfold increase in ice-core BC concentrations, with most change occurring in winter. BC concentrations after about 1951 were lower but increasing. At its maximum from 1906 to 1910, estimated surface climate forcing in early summer from BC in Arctic snow was about 3 watts per square meter, which is eight times the typical preindustrial forcing value. 1 Desert Research Institute, Nevada System of Higher Education, Reno, NV 89512, USA. 2 Droplet Measurement Technologies, Boulder, CO 80301, USA. 3 Department of Earth System Science, University of California, Irvine, CA 92697, USA. 4 Department of Mathematical Sciences, University of Wisconsin–Milwaukee, Milwaukee, WI 53201, USA. So when you see alarming stories of Greenland meltwater, remember: soot is more powerful at melting snow and ice than CO2. November 3, 2010 in Aerosols, Arctic, Carbon soot, Glaciers. The National Geographic should stick to what they do best – photographs. That second shot is beautiful. Greenland instrumental record should be included in every article about Greenland. Also the GISP2 Greenland core, putting some historical perspective (the graph ends in 1905 though). Temperature-wise, it should be melting during the summers just as it did 70 years ago. Interesting, that the 1990-20100 trend looks as a precise copy of 1910-1930 period. National Geographic sure has gone down hill. What happened to the eye catching covers of the past? A picture of Al Gores proposed outside toilet idea is a real disappointment. You can see the same effect when an animal cr@ps on snow. It rapidly disappears down a melt hole (the cr@p, not the animal). I’m a little sceptical about the scattered ash experiment as there are other chemicals in the ash besides carbon. As you know scattering white salt will cause snow melt and that has nothing to with the absorption of solar radiation. Wood ash, for example, has approximately 10% potash content, which is what makes it valuable to gardeners and as a basis for the traditional method of making potassium hydroxide. This is one of my favourite National Geographics. I’ve red the piece several times and love the photographs. There was no AGW hysteria in it at all. This post gives the mistaken impression that all the cryoconite is from soot. That is incorrect. Various snow algae are also important (and I wonder how much they respond to N-pollution). I cancelled my NG subscription 2-3 years ago because of all the pro-CAGW articles that NG publishes. All across the Great White North mankind should be building coal-fired power plants designed with the option of producing lots of soot as a way of mitigating global cooling, in the likely event that the recent end of the 20th century “grand maximum” of solar activity causes a turn-around in temperatures. We need greatly expanded energy production in any case, after the eco-lunatics successfully stopped necessary new plants from being built for decades, and adding a soot-producing capacity would be easy and cheap. Just bypass the expensive measures usually taken to reduce particulates. On this point, I wish Anthony and some others would stop referring to higher levels of arctic ice as “good ice news.” It is bad news. Unlike warming, cooling is actually dangerous. Once it actually starts cooling, yes, everyone will immediately understand that, but we need people to understand it now, if there is to be any chance of taking preparatory steps. Yup, no hysteria comparing Global Warming to a nuclear weapon here. None at all. Just look somewhere else for your hysteria. With reference to Mike Smith’s observations after throwing ash on snow – could the faster melting of snow amongst the darker debris of ash and unburnt (black) coal have something to do with a slightly higher heat absorption rate from the sun, as opposed to reflection from the purer snow? Presumably only clear-air soot has this effect? Soot and particulates that form cloud nuclei are inside the snowflake/ snowdrift. It would be interesting if the soot was gathered by its melting into these sinks, a sort of facial scrub for the ice-pack . This would appear to be another forcing that could hinder a recovery of arctic ice extent. I may have missed it but have you previously posted information from this study? “The quickest, best way to slow the rapid melting of Arctic sea ice is to reduce soot emissions from the burning of fossil fuel, wood and dung, according to a new study by Stanford researcher Mark Z. Jacobson. Easy enough to duplicate the results. Sounds as simple as a high school science project. Good for Greenland. I hope they don’t mind if a few million refuges migrate there. I’d be interested if any of the ice cores from Greenland were ever checked for soot or its chemical fingerprint? The forest fires in North America were not put out until recently and would either burn out or keep burning until rain/snow extinguished them. I agree with that. 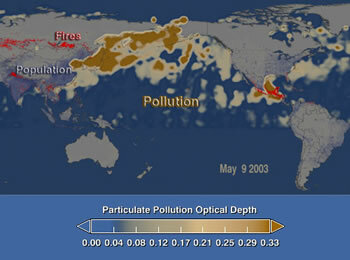 The problem is that the almost totally soot-free emissions from the U.S. are nothing compared with the heavy particulate emissions from China – a large fraction of which wafts across the oceans to settle on other countries, including the U.S. West Coast, where up to 40% of the soot comes from China. But do we hear criticism of China by eco-fascists? Hardly ever, and the occasional reference is extremely muted. If they gave a damn about pollution, these NGO puppets would be railing against China 24/7/365. Instead, the ultra-clean U.S.A. is their target. That’s like saying a pimple is second only to heart disease in human mortality. CO2 has never been shown to be a problem. At all. But then this article was from New Scientist. My apologies, the article was from Science Daily, not New Scientist. Soot levels are moderate but very variable (presumably reflecting variations in forest fires) until the 1880’s. They then rise steeply to about 1910-15 and then trail off slowly. This almost certainly reflect the coal-powered industrialization of the US, and the gradual cleaning up of same. In recent years soot levels have been about the same as they were before industrialization (but less variable), suggesting that residual industrial soot more or less makes up for the decrease in forest fires. The Clean Air Act incidentally is hardly noticeable in the record. Not so long ago, the Northeastern US put a lot of soot in the air too. This source would have a much easier time reaching Greenland, while China’s soot would best explain the loss of Asian and Alaskan Glaciers. I wonder what the environmental halflife of soot is. Coming from Alaska and using ash from wood stoves from wood I chopped down and split and burnt, I will say that is exactly what happens. Other chemicals non withstanding, ‘soot’ and ash do produce that effect extremely well, which is why we save it to sprinkle on our walkways so we don’t slip. Now you know why Nat’l Geographic made my no renew list. If the surface of the ice caps is covered with lakes several feet deep, How do scientists count the layers of snow in ice cores? And what does melt and refreeze do to the trapped “air bubbles”? Surface melt only occurs towards the edge of the ice sheet. The most ice cores are collected from the high, cold interior of the ice sheet where melting rarely occurs. When it does, melt layers are be detected (and their abundance used as a proxy for warm summers. No problem with the mistaken reference, I tend to use science daily for descriptions of studies since they provide a cleaner and easier to understand synopsis, but I still check their info with the official abstract from the study to see if it is accurate. Also there are NGOs in China that are attempting to get China to clean up their environmental act, and I suspect that “railing against” China is not considered to be a very effective technique in accomplishing this goal. As for the comparison that mentions CO2, this was also in the peer-reviewed research paper and was not a made-up comment by the writer at Science Daily ( I checked it with the official abstract before including it in the original post). Northern hemisphere soot also explains why the Antarctic ice is growing while the Arctic is shrinking. Most of the melting of the Greenland ice cap is at the edges. The summit, where the ice cores were taken is even in summer some 0°C to -40°C, thus remelt is quite seldom. 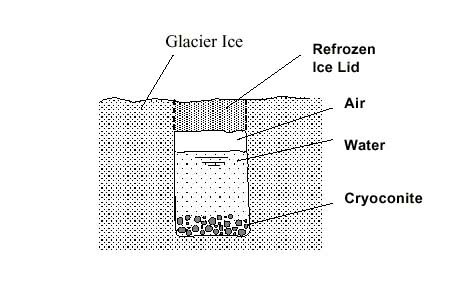 If that happens, that part of the ice core have little air bubbles left, while the adjacent parts have a surplus. Normally these parts are discarded for CO2 measurements. Also some remelt may happen in near-coast ice cores of Antarctica (Siple Dome had several remelt layers) but preferentially ice cores at colder places without remelt layers are used. I’m not sure why this is a surprise to anyone. I was hiking in the Canadian Rockies in 2003 and it only took one look at what was billed as a “melting glacier” to realize that the change in albedo due to soot/ash was a major contributor to the melt. BTW, that was the “year of the fires” in the Canadian Rockies. Our last day in the backcountry, we woke to a literal rain of ash from the massive wildfire on theother side of the ridge. Not all soot in man-made. Note that one of the authors of the study is James Hansen. 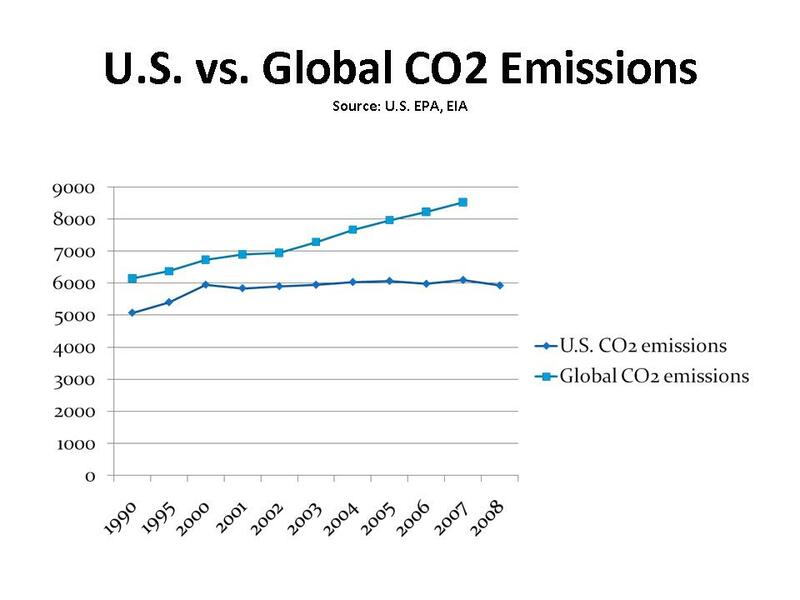 I did look at the CO2 chart you provided, and while it is accurate, the issue may not be this straightforward. The natural addtions had reached an equilibrium point and were not causing any annual rise in CO2 concentrations in the atmosphere. The the combination of the two CO2 sources is causing a rise in the CO2 level. Even though this change is a miniscule portion of the atmosphere, the radiative impact of the change has been measured. http://en.wikipedia.org/wiki/File:Radiative-forcings.svg However, the impact of this radiative forcing is a vigorously contested issue. Lot of money and time is spent on various Greenland research projects. More recent and one of the major projects goes under name NGRIP (google it and it is everywhere) measuring Beryllium 10Be deposits in the Greenland’s ice cores. What do they come up? by Berggren et al. from GEOPHYSICAL RESEARCH LETTERS, VOL. 36,2009, published 2 June 2009. Greenland warming of 1920–1930 and 1995–2005 – Chylek et al. (2006) “We provide an analysis of Greenland temperature records to compare the current (1995–2005) warming period with the previous (1920–1930) Greenland warming. We find that the current Greenland warming is not unprecedented in recent Greenland history. Temperature increases in the two warming periods are of a similar magnitude, however, the rate of warming in 1920–1930 was about 50% higher than that in 1995–2005.” Chylek, P., M. K. Dubey, and G. Lesins (2006), Geophys. Res. Lett., 33, L11707, doi:10.1029/2006GL026510. Re references to BC and relative importance – You may be interested in locating a few publications by the quiet and competent Dr Tami Bond (Illinois State) who has done a lot of the spade work in bringing Black Carbon to the attention of modellers (it used to be left out). She would immediately say she as not the first, but she certainly was early. Chris Roden has also jumped in with both feet (her student). The heating value of BC in the air is very high (about 640 times that of CO2 per kg but was down-rated because of its short airborne lifetime. Recently better equipment has shown that ultrafine BC aerosols in the PM0.02 range are very plentiful. The implication is that the heating value of a kg of carbon in this form is much larger than previously supposed (because it has a larger surface area without an increase in mass). Biomass combustion is a prolific source of BC ultrafines as are improved diesel engines. This BC chapter is not yet half written. The black-bottomed holes are macro effects of BC deposition. What appears to be temperature-related melting may owe more than expected to BC ultrafine deposits over the whole surface. The face-on surface area (heat capturing area) of a PM0.02 particle is 1/250,000th the area of a PM10 particle, but is only 1/125,000,000th of the volume meaning it has 500 times the heating power per kg. If ‘standard’ PM10 BC is assumed to be 640 times the heating power of CO2, kg for kg, then a kg of PM0.02 has 320,000 times the forcing of a kg of CO2, and that is assuming CO2 is as powerful as the modellers have it (something upon which considerable doubt can be placed). As PM0.02’s stay aloft much longer than PM10 particles, the importance of ultrafine BC may still be grossly ‘misunderestimated’. I completely agree, Alec. Completely. Even though this change is a miniscule portion of the atmosphere, the radiative impact of the change has been measured. http://en.wikipedia.org/wiki/File:Radiative-forcings.svg However, the impact of this radiative forcing is a vigorously contested issue. You believe wikipedia? Are you really unaware of the problems with wiki re: climate information? You need better sources. That link is so skewed it makes my teeth itch. The point of the experiment was to demonstrate that darkened snow will melt much more quickly than virgin snow. That said, at Anthony’s suggestion, I have ordered some carbon black and will repeat the experiment this winter IF Mother Nature will cooperate and give us a deep snow with no wind. Soot is like dust it seemingly gravitates more dust and soot to it. Of course at the end of every melting season is when you really what to photo the “horrible” levels of soot, but that’s only if you really want to go all out with the psychological effects of “proper” propaganda . . . . uhm, or so I’ve been told, like, yeah. It must be really odd though out on the great ice where hundred of thousands of years of accumulated soot has been concentrated packed to abnormal levels. The soot and dust floating up to the surface ice from down below from the internal rivers that is pushed upwards through cracks and what not from all that pressure from the ice on top of the rivers, all of which is added to the soot from the melting new snow and ice, and even older ice. When you try this crap with photographing the all the soot along the high- and freeways during winter after a few month’ of snow fall and even though the soot emissions from heavy trucks and what not have been cut by more ‘an 90% in the last 20 years it looks pretty darn horrible. In the end though it’s only propaganda value really unless you can prove where the soot you are wishing to find comes from, ’cause, after all, a “coal dust storm” from China will redistribute all their coal mining dust like the Sahara sands is getting redistributed over to the Americas during the great sand storms. indicate, at least for the last three years for which they provide data, that significant portions of Greenland have been under severe to exceptional drought conditions for the entire time span. If the decline in mass balance of the Greenland ice cap has really been accelerating recently, that would at minimum suggest that temperature alone is not necessarily the major driver of that trend. If the replenishing snowfalls have been in serious deficit, even if the temperatures were in decline, the mass balance would still be falling. Temperature is always only one of vast assortment of influences on the global climate, in Greenland and across the entire planet. The obsessive focus on this single metric is the major implicit fallacy that has made most of the dubious “climate science” so laughable. You’re missing your control – you need to repeat the experiment in the shade, and in various temperature conditions (in case the heat is being absorbed from the atmosphere, unlikely as it may be, and because it will only be above a certain temperature boundary that this effect is enough to melt otherwise unmelted snow/ice). If you want to make things more accurate, you also need a replicable way of distributing the soot evenly. Come to think of it, you would improve the data gathered by testing various concentrations of soot, although I don’t think that affects the basic experiment. Finally, I would formalise your technique for taking measurements – perhaps with a grid, but however you do it, you need to define where you’ll take them before the experiment starts if you want to rule out (unintentional/subconscious) selection bias. Can we paint soot white? In response to a number of commentators regarding ash melting snow, yes of course it does, but my contention it is the soluble chemicals in the ash that lowers the melting point of snow in exactly the way that salt spread on snow does (whether there is any sun or not). Another effect of ash on snow and ice is the abrasive effect of the ash particles which will help prevent slipping. And yes, I don’t deny that dark ash will also absorb any sunlight and warm the underlying snow. But you cannot, if you are true to the principles of scientific enquiry, simply assume that all the melting is due solely to solar absorption. It’s rather like saying all global warming is due to anthropogenic CO2. As to carbon and other pollutants in the atmosphere which eventually fall in the arctic, I suspect (but have no proof) that any water soluble chemical pollutants will have been to a large extent dissolved and deposited in rain before reaching the arctic. Thus any arctic melting due to soot will be due primarily to solar rather than chemical effects. As to further experiments, I have ash from many bonfires (I prefer to burn paper, wood and card rather than shipping the stuff by car to a recycling centre until our local incinerator project starts producing power) which I will leave out in the elements for any chemicals to dissolve.If we have snow this year I will compare the effects with fresh ash. I will then report back in the spirit of backyard science. Where will National Geographic put the retraction when all of the Climate scientist’s who only follow the facts (no group-think) refute, or at least give alternatives to the conclusions of this article? I am sure this will not be allowed to stand! Appreciated Ferdinand’s comments and his link to the literature relating historical “climate” warming rates to contemporary “climate” warming rates in Greenland. The information appears to conflict with hypotheses (perhaps more accurately described as conjectures), posited by the AGW community of scientists, that the current, i.e. 1970-2000, warming RATE is unprecedented. More investigation here is clearly required to make such observations on the historical warming rates in Greenland robust – they will better help us determine how unique the 1970-2000 global climate warming RATE and its amplitude is. I do, however, have a conceptual problem understanding the highly localised nature of the “soot”-induced surface melting at the surface of the Greenland ice sheet – what constrains “soot” to such localised spots after its presumed transport as a fine dust from distal sources? Also, cannot volcanic ash, for example, transported from the Aleutian arc volcanoes, have the same effect, if we ignore, for the time being, the cause of the localised melting effect? So the dark cryconite is 95% other stuff. Soot just makes it blacker. What color is it before adding the soot? Well, it’s probably gungy brown, which has only a slightly different absorptivity (~0.80 versus ~0.98). I.e., soot will absorb about 15 to 30% more sunlight. To the extent that the cryconite originates from natural processes, eliminating the soot is still going to leave a dark deposit that will melt snow. In response to a number of commentators regarding ash melting snow, yes of course it does, but my contention it is the soluble chemicals in the ash that lowers the melting point of snow in exactly the way that salt spread on snow does (whether there is any sun or not). You’d get exactly the same effect with dark rock – or, in fact, to a lesser degree, with light rock. Care to do the thermal analysis on that one? I’ve spent considerable crossing virgin snow and ice fields with air temps below (sometimes WELL below ) freezing. And a rock, leaf, twig, anything – that falls – or is placed – anywhere in that kind of field will slowly sink out of sight. But not so slowly that it’s not noticeable. The speed of the effect is correlates directly to the presence or absence of and the brighness of sunlight. It can be “very speedy” (relatively speaking) if the sun is bright/hot. Try it. Y’all are flailing because apparently some of the participants here have never been exposed to elementary thermodynamics. You’re looking for “causes” that are extraneous and unnecessary. Those “causes” may enhance the effect, but are neither necessary nor sufficient to produce it. It’s not that hard to understand. As cryconite forms from any airborne dust particles – just how much of it is demonstrably ‘soot from heavy industrial activity’? I mean, dust isn’t just from a smokestack – what about dust from farming, desert sand, volcanic debris? I remember in the UK from time to time we used to get covered in sand blown up from the Sahara. Not just a little bit either – probably million of tons of the stuff, given how far it was spread -I wonder if Arctic doesn’t get a load of that from time to time.. What are we going to do, tax sand dunes? BTW – I should have mentioned that none of this is directly related to or caused by “warming” (in the sense of atmospheric warming). It IS related in that once the ice is melted, then the albedo of the underlying rock, water or ground will be different from that of the ice and will induce atmospheric warming. I understand that National Geographic was quite active in the 1970s with climate fright, mostly of the cooling sort. The contributions of Time and Newsweek to the cooling scare are notorious and all over the net. The NYT made its contribution to cooling hysteria both in the seventies and the 1890s, and had some bad warming going down in the thirties…but to get to their old crud you have to become a subscriber to the NYT. Eeew. I’d like to add National Geo’s cooling commentary to my collection of journalistic climate gems from the past. It may not rank with the 2009 Sydney Morning Herald’s front page evacuation plan for the NSW coastline, but I’d still like to have it. Trouble is, when I google, all I get is stuff about how the National Geo really didn’t say much at all; how, according to a “study” there really wasn’t a cooling scare anyway; and how the scientists of the time, like modern scientists of Thomas Fuller’s acquaintance, were just misrepresented by media babblers. I found a graph from one issue showing how temps might go up or go down – hey, no fun! – and that’s all you get, and in a severely shrunken form. Damn. I just wanted something to go with my 1979 Time cover of the terrified family shivering through Christmas. Love all that stuff. Anyone got a good link? I would think that the majority of soot-like particles generated a large distance from the Arctic areas would become involved in the precipitation process along the way & ‘washed’ from the air. Along those lines, is the soot/dust found in the Arctic embeded in the fresh snow flakes or is it on the top/surface, deposited after the snow fall? I would think any soot within a snow flake would not be nearly as effective in absorbing radiation as would soot on the surface. How cold does it have to be before any soot exposed to direct solar radiation at expected solar angles of the high latitiudes cannot be warmed enough to start melting? How much melting does soot cause on a snow surface at night & at what temp does any melting stop? is worthwhile reading about Greenland Vikings, especially the well-written “history,” which gives a decent over-view of what has been learned, though of course the writer never ventures far from the somewhat timid conjectures which can be drawn, after the tedious process of sifting sand and examining frozen dung and stray items. I also think archeologists in Greenland have to be careful not to irritate the people who hold the purse strings, by stating too clearly how warm the MWP actually was. For example, the estimates of the population of Greenland Vikings have trended downwards, from up around 8000 down to 3000, or even less than 1000, in one recent thing I read. However items slip by this temerity. For example the above link mentions there were 100,000 goats and sheep in a single district of the larger settlement. Then compare that number with the National Geographic’s description of modern efforts to even start a herd, with modern tractors and fodder airlifted in when necessary, and you get a clear idea of how much warmer it was 1000 years ago, because modern herds can’t match the Viking’s. I think Mann will get more funding just for his lawyers this year than a lot of these fellows see in a decade. Yet think what might be discovered, if you just set these guys free along the coastline with a sonar, or sent them to undisturbed patches of snow to take cores and look for Viking soot. If I had a tenth the funding Hansen diddles away each year, I’d send some of these fellows up to poke around the coast of Newfoundland, and pay others to examine the lowest levels of Newfoundland’s oldest settlements, to see if the oldest strata contained any Norse items, along with the English. It seems a real pity when we don’t learn as much as we could, because some fear certain truth might upset their political applecart. mososmoso: I’d suggest you hit the Saturday yard sales. Most of the people of my generation kept old issues of the NG simpley because they were too pretty to throw away. I’ve seen some real gems. In summer, on High Sierra snow fields, there are lots of holes. at the bottom of each one is something which absorbs sunlight and radiates warmth. It can be a stone from the surrounding cliffs, a sprig of conifer needles or an insect, even a butterfly will make a hole. Just to keep things interesting, sub-snow boulders will absorb what light reaches them through the snow and melt back the snow around and above them. This makes trapdoors that bring the backpacker face down in the snow with one leg in a narrow hole. trying to get back up with a backpack on is strenuous. Especially if you push down with a hand and it plunges through also. I learned to lay my staff flat and push on that. One place where a hoe handle is better than those fancy ski pole things. When I get deep snow in my long drive way, it is easier to spread fine black peat in a thin layer, than to scoop 250 feet of 18″ deep stuff, three to four sunny days and it is drivable (less than 6″ deep), and yes the shade from the trees slows it down a lot when cold. More organic than salt and faster. I thought the point of the article was to show how little effect soot has, because no sooner is it deposited than it gets covered up and whiteness returns. So the albedo calculation needs to have a time of visibility component in it also. Does it? Living in Albuquerque and visiting Santa Fe often, it is common in early spring to see bumps of ice in the road around the square. The temperature is warm enough to melt snow but the ice keeps on keeping on. The thing I noticed was that the ice is usually covered in dirt. You would think that the dirt makes it darker and more absorptive. However, it also blocks direct UV exposure. UV probably directly breaks ice bonds photonically and most likely plays an important but little discussed role in the melt rate of snow, ice, and glaciers. Not really. When a parking lot is plowed there are piles of snow mixed with rock and sand. I have noticed that these piles tend to shrink over a few weeks and that the areas covered with rocks tend to shrink slower than areas without them. I have seen many large holes between the rocks. I assume that this is due to the insulating properties of the rocks. Or it could be that unprotected snow sublimes and the rocks stop that. I think the author here is deliberately confusing the climate of one small region of the globe (the North Atlantic and irregular NAO effects) with global temperatures. Soot and ash are also called “The Black Icebreaker”… local fishermen in Greenland use it in the spring as icebreaker (from haurbor to open water)… soot and ashes are spread on the ice fore a rapid formation of a channel. How much ice/snow can particulate and black carbon really melt? Applying the doom and gloom scenarios, cities like Chicago should remain fairly ice free in the winter. 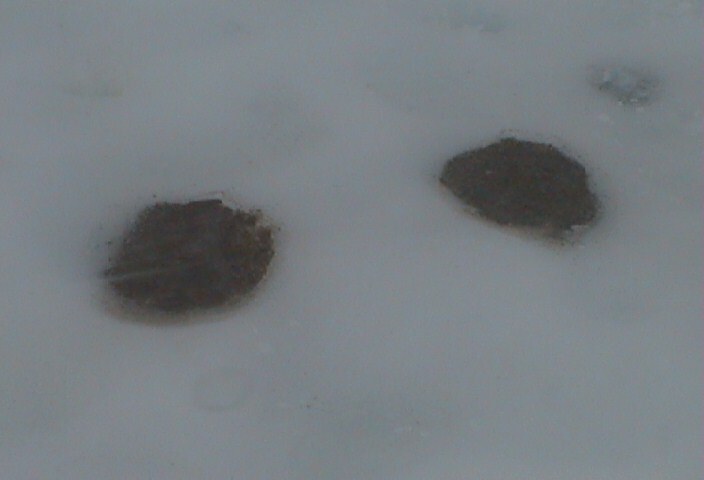 Instead, the snow and ice which do not melt look rather gross and depressing. I think there needs to be a serious application of reality applied here. If particulate and black carbon can’t keep Chicago ice free in the winter, how much ice/snow can it really melt in a even colder climate? The IPCC’s estimate of additional forcing from all added CO2 since the Industrial Revolution is ≈ 1.5 Wm-2. The formula for calculating change in radiative forcing (ΔF) in Wm-2 for carbon dioxide (CO2) is given as ΔF = αln(C/Co) where C and Co are the current and pre-industrial concentrations of CO2, respectively and α = 5.35. Atmospheric CO2 is presented in parts per million by volume (ppmv). There is no universal standard for what we mean by a doubling of CO2 and various numbers are used, most commonly 560 (2×280 — the common pre-Industrial revolution reference) and 600 (2×300 — presumably benchmarked from early in the Twentieth Century). A doubling of pre-Industrial Revolution atmospheric CO2 = 5.35 x ln(560/280) ≈ 3.7 Wm-2. This information is from http://www.junkscience.com/Greenhouse/What_Watt.html which goes into a more detailed discussion of radiative forcing. I rather think that you might be mischievously trying to provoke a ‘spat’ here. I can’t remember quite where I read it but there are several papers and articles that would show a parallel ‘warming’ of other areas of the globe at the same latitude as Greenland over that same time frame. Doh! Wish I had a better memory and a more disciplined attitude to keeping articles. Even so, the proponents of AGW would use localised, short term, unsupported effects/data/observations to maintain their proposition. The difference here is we are discussing well researched papers and observations which have withstood initial peer review, have been accepted over many decades as accurate representations of past trends and yet have been free of the effects of Ch*n*s* Power Stations and Redneck SUV emissions. An above post indicated the RATE of increase in temperatures in the early 20th Century exceeded that in the latter part. Face it. The evidence keeps on coming out, the chips are down, no matter which way you try and cook the books…..the tide has turned, look out your warm clothing, start splitting more logs than you think you’re going to need and BTW you might want to buy a good hunting rifle before it’s impossible. It already is impossible in the UK. Alpine glacier retreat is more due to increased insolation and reduced snowfall, probably from decreased cloud cover, than it is from warming per se. During the 1980s and 1990s it was not uncommon in winter in parts of the Swiss and French Alps to have reddish brown Sahara dust deposited on the snow by the Scirocco, and that did cause visibly faster melt. While I have no doubt that soot can help to melt ice and snow, I do not think that all soot is man made. There are plenty of naturally caused forest fires, volcanoes and other sources of soot emissions on this planet in addition of man. Even with that it is a “don’t care” issue. What? Dave, the “control” condition is the adjacent, continguous, surrounding, snow that does not have soot on it. If you spray cologne on your right shoulder, but not your left, and someone says your right shoulder smells of cologne, but your left does not, you really don’t need to repeat the study the next day, or on another person, or on a cold day, or with a taller person, or with a person who has anosmia, to be fairly certain that the cologne led to the scent.